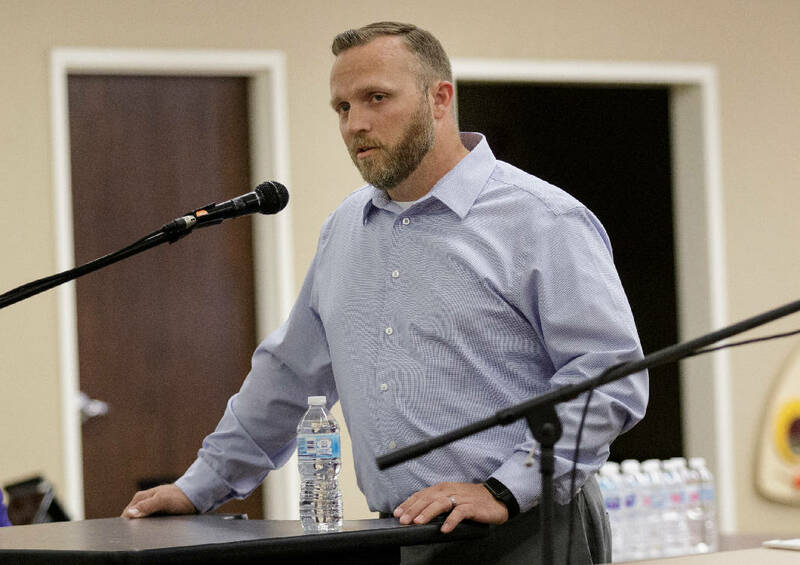 Staff photo by Doug Strickland / Dade County Board of Education District 2 candidate Daniel Case answers a question during a debate at Dade County Public Library on Thursday, April 19, 2018, in Trenton, Ga. Multiple candidates across several races were in attendance for the forum, which precedes the May 22 primary election. Updated at 8:19 p.m. on Monday, Feb. 4, 2019, with more information. Staff photo by Doug Strickland / Dade County Board of Education District 2 incumbent candidate Jennifer Hester Hartline answers a question during a debate at Dade County Public Library on Thursday, April 19, 2018, in Trenton, Ga. Multiple candidates across several races were in attendance for the forum, which precedes the May 22 primary election. TRENTON, Ga. — The Dade County Board of Education voted Monday night to decrease tax breaks for elderly residents. The board unanimously passed a resolution to cap the value of a homestead exemption for residents 65 and older at $150,000. Currently, those residents pay no property taxes on their homes and up to 5 acres of their land. Monday's resolution also adds a requirement that residents live in the county for at least five years before they can take advantage of the offer. The proposal now goes to county voters on a referendum. Superintendent Jan Harris is not sure when that referendum will take place, but she believes the board will place the item on a 2020 ballot. Harris said about 1,500 people take advantage of the exemption. She does not know how much revenue that costs the county every year. But if those pieces of property are each valued at $150,000 — the average value in the county — the exemption keeps about $1.3 million out of the school board's hands. That money represents about 6 percent of the total general fund revenue of the district's current budget. Harris said the current tax break treats every elderly resident the same, regardless of how rich or poor they are. "If you have a $125,000 house, you're exempt," she said. "If you have a $1 million house, you're exempt. There's no equity." The change would not affect people now enjoying the 100 percent tax break. Harris said those residents' exemptions will be grandfathered in. The proposal now goes to the desks of state Rep. Colton Moore, R-Trenton, and state Sen. Jeff Mullis, R-Chickamauga. To put the item on a referendum, the lawmakers have to pass a local act through the Legislature. Harris said school board members previously asked former state Rep. John Deffenbaugh, R-Lookout Mountain, to carry a similar local act, but he rebuffed them. She does not remember exactly when that happened but said the meeting took place after she joined the district in April 2016. "He was not in favor of taking it forward," she said. "That's what stopped the process." Moore met with Board of Education members Carolyn Bradford and Jennifer Hartline on Thursday to discuss the resolution. He said they told him they would cut the overall millage rate if the referendum passes, lowering most residents' taxes as they add more people on the rolls. Bradford said the full impact of the proposal will take a long time to see. First, voters have to actually approve the referendum. Then, year by year, another group of residentswill reach the 65-year-old threshold. Slowly, the extra revenue will trickle in. "We can't promise that's what we're going to do," Bradford said of a millage rate cut. "But that's pretty much the intent." Board member John Warren argued the district needs that revenue because it does not receive much from the state in the way of equalization money. That is extra funding dedicated to the poorest districts in Georgia, based on property values in each county. While some swaths of Dade County are very poor, Warren said, the high value of nice homes on Lookout Mountain offset that, keeping them from enjoying the boost in state funding. At the same time, he said, the district does not receive tax revenue from wealthier properties, many of which are exempt. "That's not hypothetical," he said. "It's not fictitious. It's real money that we're losing." Board member Daniel Case said the change to the exemption is important for younger members of the community. He argued they are paying extra because of the current, generous exemption. "It will benefit the schools," he said. "But it's also going to benefit the county as a whole. When folks like myself when we're not having to pay that ridiculous tax, when it's just spread among a few others, we're able to spend more money on the things that matter."